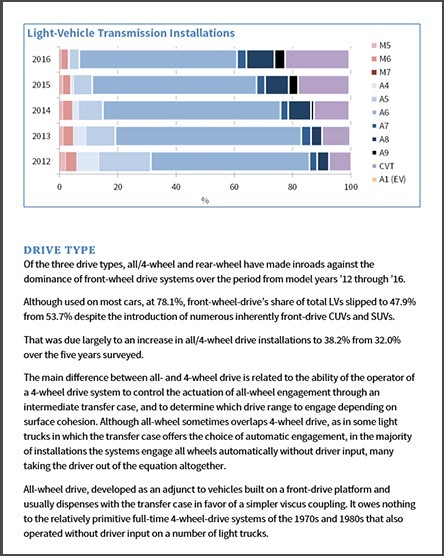 Get data and analysis covering 5 years of equipment take rates for powertrain, ADAS, safety and other major features. Five-year analysis of industry take-rates for over three-dozen powertrain attributes and factory installed equipment types, covering 2012 through 2016 model years (except where noted below). Report consists of downloadable PDFs of detailed analysis and spreadsheets of data tables. Early rate expires soon – order now to secure discount. Special pricing available for WardsAuto paid subscribers. Contact us for details. Click Button above to purchase via secure portal. Downloadable files accessible immediately upon payment. This report is only one of the many areas of insight and intelligence offered by WardsAuto on the coming changes. We also offer forecasts of vehicle and powertrain production, competitive green powertrain strategy analysis, fuel economy indexes and much more. For more information on these opportunities and package options, please contact wardsintelligence@informa.com or click below to tell us about your unique information needs. 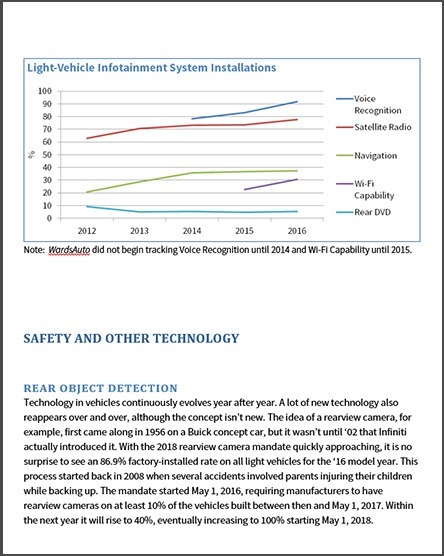 Technology continues to evolve and improve on cars and light trucks, as reflected in this report that covers the model-year 2012-2016 periods. New light-vehicle sales totaled 14.43 million units in calendar-year 2012 and have grown every year to reach 17.46 million in 2016. Market conditions have led to an increase in consumer demand for light trucks, including crossover utility vehicles (CUVs) and sport utility vehicles (SUVs). Market share of CUVs has increased from 24% to 32%, while cars have slipped from 50% to 39%. The industry has seen other big changes over the study period. Never before have traditional internal combustion engines been more efficient, nor has there been a greater selection of electrified powertrains. This is being driven by fuel economy legislation and consumer demand for improved technology. Low fuel prices in the U.S. have to some extent hindered growth of electrified powertrains, but legislative standards dictate that OEM’s continue to develop new and improve existing technologies to meet future targets. Safety, connectivity and convenience are driving development and implementation of new systems and options being offered. Connectivity and convenience are often related, such as with Bluetooth, Wi-Fi, and voice recognition technology. Convenience is also often married with comfort features, including power seats, heated seats, power heated side-view mirrors, navigation systems, satellite radios, keyless entry systems and remote start systems. Much has changed regarding safety since 2012. The industry is now being driven to rearview cameras, front and rear sonic sensors, 360 degree cameras, blindspot detection and alert, lane departure warning and many other features meant to improve safety in the present as the U.S. and global automotive markets move towards fully autonomous vehicles in the future. 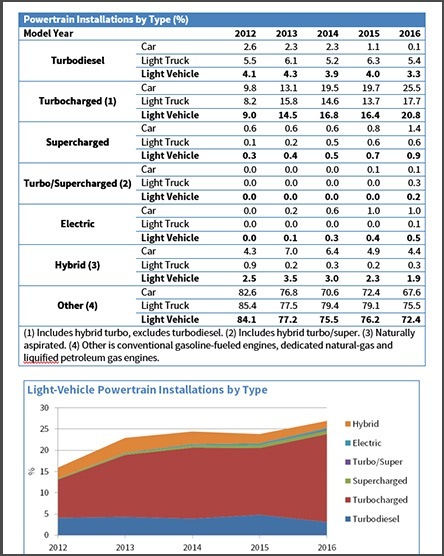 This report examines trends in powertrain, comfort and convenience, safety and other technology fitment rates on new U.S. light vehicles, highlighting changes in the adoption of such technologies. 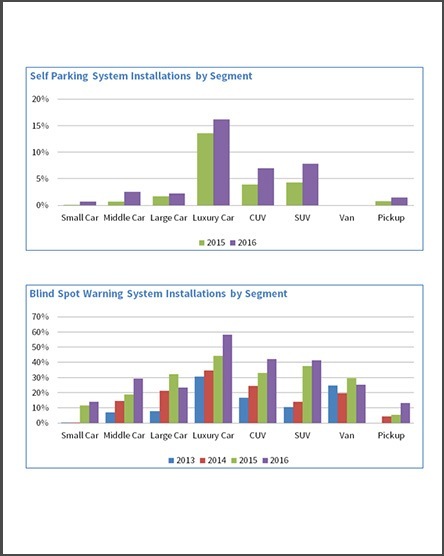 The following data is summarized from WardsAuto’s semi-annual factory installation reports. The data sets are compiled through WardsAuto’s exclusive annual surveys of factory-installed equipment and additional research. Simply click to order this special report now. You may download it immediately upon payment. Price: $1,875.